BLACK buck, known by various regional names, is the most elegant antelope of India. Very few may know that it is exclusive to the Indian subcontinent. Its striking sandy colour and beautiful spiralled horns make it unquestionably the most splendid specimen of the antelopes. It is also the swiftest long-distance runner among animals and can keep running for about 10 km at 60 km per hour at the slightest hint of danger. Constant persecution by man has sadly reduced their number. Their large herds, which once freely roamed in the plains of North India where they thrive best, are no longer visible. During the eighteenth, nineteenth and the first half of the twentieth century, black buck was the most hunted wild beast all over India. Till Independence, many princely states used to hunt this Indian Antelope and gazelle with cheetahs. Prince Dharma Kumar Singh of the princely family of Bhavnagar possessed nine cheetahs, which were trained to catch only male antelopes. The alarming speed at which the black bucks can run and turn quickly in both directions when pursued, especially on hard, strong or cut-up terrain is amazing and comparable only to the lightning speed of cheetahs. Though this royal sport vanished with the disappearance of cheetahs in India in the early 1960s. As a result of the exploding population, the open country — which used to be the habitat of the black buck — was extensively and intensively occupied by agriculturists. This led to a serious depletion in their number. The black buck was hunted as a crop-raider. Whether or not it damaged cultivation, its flesh was relished by many. Reeling under the pressure of cultivation, hunting, black buck was reported to be extinct in many areas in the 1970s. It was only then it was enlisted as a protected animal under the Schedule-I of the Wildlife (Protection) Act, 1972, and Punjab and Haryana honoured it as their state animal. In every state, Wildlife Advisory Boards were constituted to suggest ways and means to conserve wildlife. There was also a demand to bring more areas under the aegis of the Wildlife Act, as the divided Punjab was left only with the degraded scrub jungles of the erstwhile Patiala state. In some villages of Abohar, a few herds can still be seen roaming. The animals are being protected by villagers, mainly Bishnois, despite the fact that they cause some damage to the crops. An area of 186.50 ha in Abohar was declared a wildlife sanctuary in August, 1975. 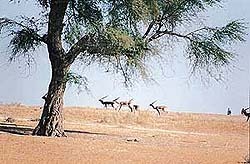 The Bishnois are a predominantly agricultural Hindu community which disallows felling of trees as well as killing of all wild animals, including birds. They show kindness towards all living beings and provide water to wild creatures around their settlements in arid tracts. Abohar has semi-arid plains dotted with sand dunes, acacia trees, beri bushes and weeds. After the construction of Rajasthan Canal and Bikaner Canal, the area has been cultivated with wheat, gram, bajra, jowar and kangani crop. All this, however, has not jeopardised the breeding prospects of the black buck. The sanctuary had 2000 black bucks in the year 1988, and now their number has crossed 4000. The strict policy of non-interference towards the local wildlife, has provided protection to peafowl, partridge, hare, jungle cat, nilgai and other wild animals. While the blue bulls remain confined to orchards and plantations, the black bucks prefer uncultivated sand dunes. The first time when I visited the sanctuary, the wildlife inspector took me to the northern side of the sand dunes, about 2 km from Dotaranwali village, where we could count 50 black bucks in one herd. Immediately sensing intrusion, the leader, a dominating male with long straight black horns, took sudden flight and was followed by the other members. It was only after covering 2 km that they came to a halt. As they started nibbling the fresh blades of wheat crop, a farmer’s abrasive call whistled them further away. Thus they kept moving the whole day, crossing fields and resting on the top of sand dunes in the late evenings. Keen eyesight and speed provide them protection. The movement of the animals in Abohar fields was too majestic to forget. It is interesting to note the colouring of their coats. The young ones have a yellowish-fawn colour. After about three years, it begins to turn black. A healthy buck has a brown-black coat. The colour usually fades a little during summer. But after the rains the the velvety texture acquires a sheen. The horns of the yearling buck are without a spiral. In the second year, a large open spiral develops. The full number of spiral twists come up with the dark coat at the end of the third year. Female bucks with horns are, however, rarely found. A buck with five does constitutes a family group. The leader of the herd is usually an old and vigilant female. Come February, and there are fights among the bucks to gain possession of does. These sometimes result in deep wounds and many a time death. Given protection, black bucks breed prolifically. One or two young ones are produced at a time. The mother usually conceals the fawns in the grass. But they gain strength rapidly and soon join the herd. Fragmentation of land holdings, extensive cultivation of land, occasional attacks by jackals and stray dogs and competition for grazing posed by the local cattle are some of the problems that are coming in the way of the protection of this endangered species. Undoubtedly, the protection afforded to black bucks by Bishnois is laudable, but the government too should come out with a plan to save them.